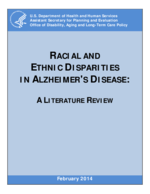 This paper reviews the research literature on ethnic and racial disparities as it relates to Alzheimer's disease. The literature shows consistent and adverse disparities among Blacks and Hispanics compared to non-Hispanic Whites in the prevalence and incidence of Alzheimer's disease, mortality, participation in clinical trials, use of medications and other interventions, use of long-term services and supports, health care expenditures, quality of care, and caregivers. The reasons for these disparities are not well understood, but include possible genetic differences, prevalence of other diseases that may increase the risk of Alzheimer's disease, higher rates of poverty, and lower levels of education. In addition, differences in the use of services and expenditures may be related to cultural differences and racial and ethnic discrimination. Although these disparities are well known, little is known about the effectiveness of various strategies, such as cultural competence training, to address these differences within the context of Alzheimer's disease, with almost no studies available that evaluate possible interventions. In seeking to alleviate these disparities, one of the important points made in the IOM's Unequal Treatment report is that matching needs to services is a more important goal than trying to provide equal amounts of services to different groups (Smedley et al., 2003). Both undertreatment and overtreatment can be a problem, and it would be undesirable to insist on all patients being equally overtreated. Instead, the goal should be the right care, delivered to the right patient, at the right time, in the right setting (Fowler et al., 2011).